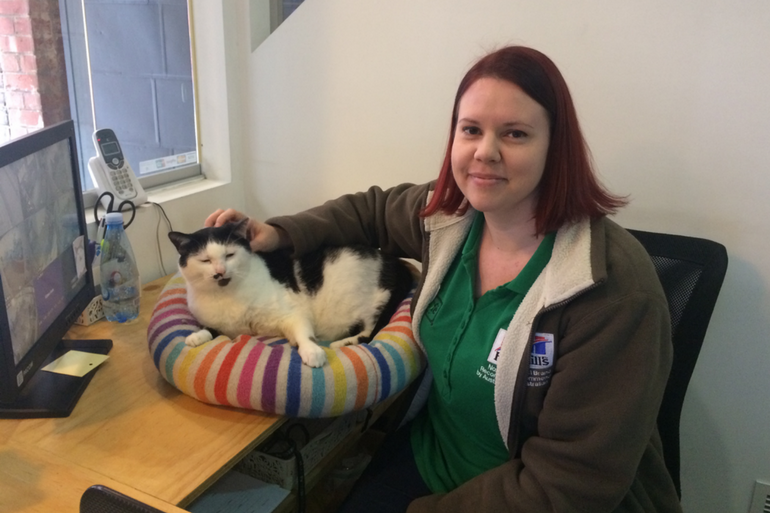 Anita Loughran with Lynx, the oldest of the 15 cats at Cat Cafe Melbourne. Photo by Elana Frost. Anita Loughran is living an animal lover’s dream. While on honeymoon in Japan, Anita and her husband Myles Loughran were introduced to cat cafes and “fell in love with the idea”. In 2014, Anita and Myles established Australia’s first cat cafe in Melbourne’s CBD. 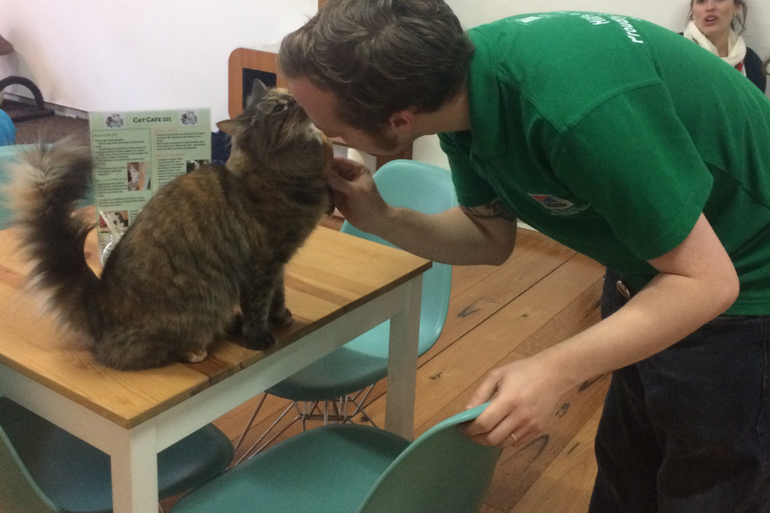 Every day, Anita and Myles welcome visitors of all ages into Cat Cafe Melbourne, their unique hybrid business. There, patrons can sip coffee while mingling with the cafe’s 15 feline employees, all of whom are rescue cats. Among them are Sherlock the Turkish Van, Ruby, who has only one eye, and Lynx, the oldest cat of the group. There’s just one small problem. Anita is allergic to cats. Small, because Anita refuses to let her allergies interfere with her love of felines. She even took a drastic measure, undergoing a treatment called allergen immunotherapy, to ensure she could work with her beloved cats. The Australasian Society of Clinical Immunology and Allergy (ASCIA) states that about 20 per cent of Australians are affected by allergy at some time in their lives. Professor Connie Katelaris, a clinical immunologist who practices at Campbelltown Hospital and Western Sydney University, says cat allergy is the most common type of pet allergy, and pet allergy is the third most common type of allergy overall based on results from skin testing. Dust mites and pollen come in at first and second, with about 70 and 50 per cent of patients showing sensitivity to them respectively. “What people become allergic to are the proteins secreted by the animal that are found in things like the sebaceous glands and in the saliva. And these get transported on the hair and the dander so it’s proteins in the secretions that are generally where you find the major allergens,” Professor Katelaris says. This means there is no such thing as a completely allergen-free animal. But Professor Katelaris says hairless breeds may cause less of an allergic reaction because with no hair, the animal lacks the “vehicle that spreads [the allergens] around”. Anita is more than happy to put aside her discomfort for the sake of her love of animals. “[My allergies] don’t stop me. They never will,” she says. But she’s not the only one. Fiona Newbert, a social worker from Sydney, does the same. Since early high school, the 31-year-old has been suffering from a severe cat allergy that is progressively worsening. In addition to itchy, watery eyes and a runny nose, Ms Newbert’s allergy causes chronic sinusitis, which means she “constantly” has sinus, ear and tooth pain. Yet, despite her severe symptoms, Ms Newbert happily shares her home with the culprit of her daily discomfort: Taffy, her black and white domestic shorthair cat. “I would never ever live without a cat,” she says. “I would prefer to have chronic sinus pain every day than not have a cat. Ms Newbert says that as well as being talkative and affectionate, Taffy provides her with psychological support. Anita, who is originally from Queensland, only realised how bad her allergy was when she and Myles first established their cat cafe. The 30-year-old animal lover grew up on acreage surrounded by many animals. “Cats were always sort of a little bit more special than the others,” she says. Myles says the idea to open a cat cafe first came about during a late night conversation when both were working at call centres. But little did Myles know his wife would secretly spend the next six months negotiating with the city council to make his idea happen. Eventually, the council agreed. Myles Loughran, co-owner of Cat Cafe Melbourne, grooming Lottie. Photo by Elana Frost. Anita had always known she was allergic to cats, but by the time she and Myles established their business, she hadn’t lived with one for years. “When we first opened, my allergies were quite severe… all of a sudden being surrounded by 15 cats, it was just a bit overwhelming,” she says. This is when Anita decided to undergo allergen immunotherapy. Allergen immunotherapy involves administering a very small amount of the problem allergen into the patient in gradually increasing doses, usually over a period of three to five years, according to ASCIA. “At the end of it, the sensitivity is reduced significantly. It’s never cured, but it could be reduced by up to 50 or 60 per cent,” says Professor Katelaris. However, she says it’s a “pretty extreme and long therapy to go through when not having the animal around would basically cure the problem”, though it’s a viable solution for people such as Anita who work with animals as their livelihood. Anita underwent allergen immunotherapy for a year before stopping, and says it was “a pretty easy call to make” because of the severity of her allergy. Since undergoing the treatment, Anita’s allergy has become less severe. But she still experiences itching and occasionally needs to take antihistamines. It’s not just the owner of Cat Cafe Melbourne who suffers from a cat allergy. Myles says the cafe attracts plenty of visitors who are also allergic to cats. But why? “It’s much the same as Anita. They just love cats. We get people who have allergies and they generally say the same thing to me: It was worth it. Myles says he tries his best to make sure allergy sufferers are as comfortable as possible when visiting the cafe. It’s illegal for him to sell antihistamines because the cafe is not a pharmacy, so instead he works hard to keep the environment clean and well-ventilated. “We have air purifiers, we open the widows, we get a lot of fresh air coming through and then we vacuum every day… we come in two hours beforehand every day and clean the place,” he says. Interacting with cats occasionally when you’re an allergy sufferer is one thing, but for people like Anita and Ms Newbert who are always surrounded by the allergens, the constant exposure can be detrimental. 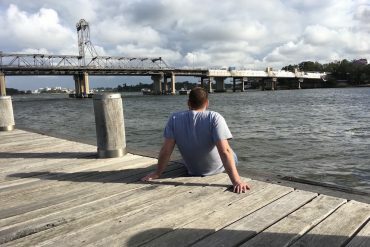 “In the more severe [cases] [people] may even have asthma switched on, they may be wheezing, so as much as they might love the animal… they’re probably going to need a treatment… obviously we don’t believe that’s a good idea because you’re still exposed to the allergen and so the level of allergy may increase,” says Professor Katelaris. But despite the daily discomfort of her allergy, Anita wouldn’t change a thing.